AppSumo Contest is Giving Away 10 Evernote Premium Accounts — for Life! We all love Evernote here. Evernote related posts are some of the most popular on the site. And it’s no wonder… Evernote is awesome! 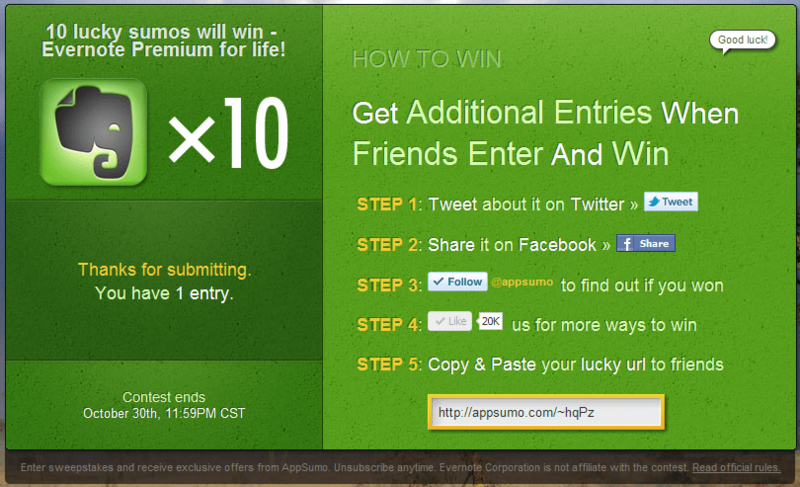 Well, the deal-giving giants over at AppSumo agree with us, and have decided to raffle off 10 — count ’em: 10! — free-for-life Evernote Premium accounts with all the trimmings. You read me right: Evernote Premium — Free. For. Life. Save yourself $45 per year, forever. AppSumo will require you to give them an email address, of course. They’re not doing this for nothing. Even if you don’t win, though, the weekly email deals they’ll send you are pretty awesome, and there’s a nice sprinkling of seriously great free stuff as well. Once you enter, you can get additional entries by sharing on Twitter and Facebook, or by sending people your AppSumo link to the contest. If other people sign up via your shares, you get extra contest entries. You can also Like them on Facebook for other ways to win, and you should follow them on Twitter, as that is one of the ways to find out if you win. The contest ends October 30th and 11:59PM CST, so get your ballots in now. You can get there by this link: http://appsumo.com/~hqPz. Yeah, clicking the link will give me additional chances to win, as well, but it’s all love, right? If you don’t want to help me out, that’s cool — a pox! a pox, I say!!! :P — then just head over to the AppSumo website and start from there. So what are you waiting for? It’s Evernote Premium. Free. For life! Get clicking, people! Let me know in the comments if you entered!